The Common Core... the Miley Cyrus of the education scene. "What's so bad about the common core?" my son asked one day when it sallied into his awareness through a Facebook post. Why on earth would the well-intentioned efforts of the educational establishment garner such a cold-- nay, shall I say, violent-- reception? Thankfully, my local district mailed out a newsletter to clear things up. 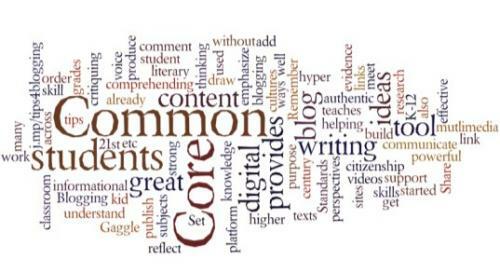 The first claim the newsletter makes is this: [By way of definition,] the Common Core State Standards set clear, consistent goals that build upon each other at each grade level... [and] provide a consistent, clear understanding of what students are expected to learn... Note the words clear and consistent. With those, I have no argument. I'm sure they'll be clear and consistent... and less academically rigorous than what we now have in place, which is less academically rigorous than what we had in place previous to those... previous to those... etc. The newsletter claims Standards do not equal curriculum or lesson plans! so emphatically as to use an exclamation mark to convey strong emotions about these standards. Red flag. Actually, that statement is absolutely, completely, emphatically, exclamation-marks-all-around false. Standards directly affect a student's education at the atomic level. Make no mistake about it, these new, higher (snort) standards for education will make their way into your living room. And why does that even matter? Why does my local district feel the need to spend precious dollars on propaganda to stroke me and croon there... there... over the Common Core? Red flag number two. What does Algebra I encompass, as far as math skills go? That's a variable, if you'll forgive the pun. What constitutes Algebra I (in practice as opposed to theory) is ultimately decided by the standards because the measurement of whether or not we've hit the mark set by the standards is the assessment. Simply, the creators of the assessment tests have the power to decide what will be taught in the classroom. Even I, small-time 08 principal that I am, will feel the effects of the Common Core, as the private curricula does homage to the new standards (it always does, eventually). What happens when new standards are rolled out is that new tests must be developed to determine who attains these standards. As the results of standardized tests carry more and more weight in defining student, teacher, and school district adequacy, more focus must be on the limited content of these ever-narrowing, one-size-fits-all tests. The stakes are high. All together, class: NEW STANDARDS = NEW ASSESSMENTS TESTS = NEW CURRICULUM. American students are already the most tested students on earth. If testing were the answer, we'd be churning out the brightest and best minds the globe over. Clearly, Captain Obviously, it's not. So what to do? Our only recourse (until Common Core is common trash) is to teach more than what's common, to go beyond the core. Smoke the standards... go above and beyond... apply diligence... demand excellence. Rocky Balboa-academic-rigor is the core... of a consummate education. Parents, whether you homeschool or help with homework, you are the trump card in your child's education. No test, no bill, no local mandate or school board can take the place of a committed, on-fire-for-education parent who is willing to smoke the core. Initiatives like the Common Core come and go. (Go, please go. The sooner, the better.) Until then, parents can take this simple action to ensure an uncommon education for everyone: Read. Together. Every day. Check out this reading list. Read the source documents on history, i.e., don't limit your study to a biography on Lewis & Clark; read the journals they kept as they slogged across our country. That's where you'll get the whole truth and the bonus of some juicy details left out by conservative texts. Read. Everything. You. Can. Parents, if you make their high bar your footstool, you can't go wrong.